Miniature American flags decorate the grave sites on Memorial Day at Riverside National Cemetery. RIVERSIDE (CNS) - A call went out today for volunteers to assist a nonprofit group in posting miniature American flags alongside the graves of servicemembers buried at Riverside National Cemetery as part of a Memorial Day weekend tribute that's expanded since it started seven years ago. Cypress-based Honoring Our Fallen began flag-placing events at the cemetery in 2012, relying on the support of people of all ages, who donate their time to plant the flags adjacent to the 200,000-plus graves at the cemetery. fourth-largest national cemetery in the country. buried at the cemetery have joined the effort in the past. resting places of all the men and women interred at the cemetery. them. Gruendyke and Leininger combined efforts in 2014 to fulfill the mission. donations is available at www.honoringourfallen.org . Earlier this morning (Friday), scores of volunteers spread out across the more than 900-acre grounds of the Riverside National Cemetery to make sure that each of the more than 200,000 graves has a miniature American flag planted next to it in time for Veterans Day ceremonies at the cemetery on Saturday. More from KVCR's Ken Vincent. 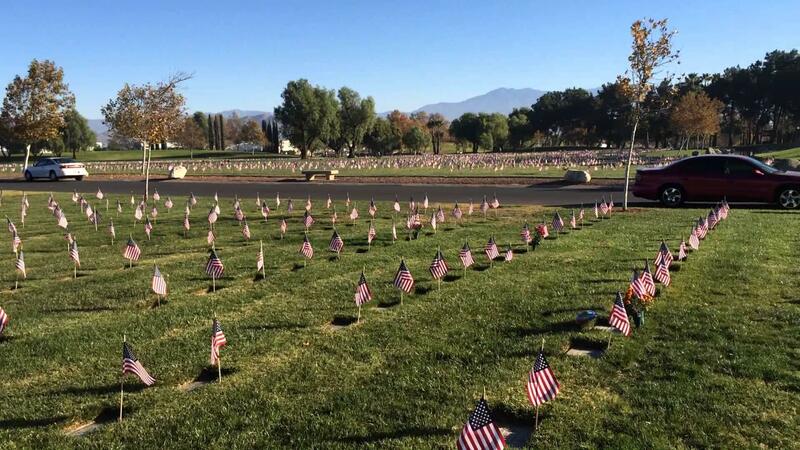 Annual Veteran's Day traditions will be taking place at Riverside National Cemetery and around the Inland Empire today. KVCR's Ken Vincent has more. A group of California veterans is sueing the state Department of Veterans Affairs for the right to end their lives in the face of terminal illness. Capital Public Radio's health care reporter Sammy Caiola has more. Riverside County is moving toward designating reserved parking spots at county office buildings and facilities for military active duty or veterans who've recieved Purple Heart medals for their service. More from KVCR's Ken Vincent.